GoFormz provides a wide variety of field types that you can use to build a form. See here for a full list of field types and how they are used. Each type of field has many different properties, allowing you to fine-tune the field’s look-and-feel, layout, and functionality. This article is a reference that lists and explains all properties for all fields. Properties by Field Type: Properties specific to just one field type or a handful of field types. Table-specific Properties: Properties specific to tables, table columns, or table rows. The difference in scope is important to understand, so let’s go through an example. In a nutshell, it means that if you have the same field in multiple places in your form — the field may look different, but will act the same and contain the same information. Each of those four field instances will have the same Field Properties (e.g. form name, default value, whether it is required or not, etc. ), so if you change these properties on one instance of the field, they will automatically change across all instances. But each of the four field instances will have different Display Properties (e.g. field width and height, font size and color, etc.). In this particular example, the expectation might be that the user fills in the customer name on the first page, and then it is automatically reproduced at the top of the second and third pages for reference. So you may want to change the field instances on the second and third page to have a smaller font and different color than the one on the first page, for example. Certain properties allow you to enter a formula or calculation to determine their value. For instance, in the example below a formula is used to change the Background color based on the value of the “Overtime Hours” field. Such fields are indicated by a [. . .] icon next to them as our example above, or by a text box with a formula symbol. Since formulas can sometimes get rather long, we provide a Formula Bar at the top of the Template Editor that lets you see the entire formula as you edit it. This is portrayed above. See here for an overview of formulas/calculations in GoFormz. The Display properties listed here are common to most GoFormz fields in the Form View. In the List View, the only Display property is Visible. See here for the difference between Form View and List View. Left: The offset of the left edge of the field from the left edge of the form, in pixels. Top: The offset of the top edge of the field from the top edge of the form, in pixels. Width: The width of the field, in pixels. Height: The height of the field, in pixels. Generally speaking, we recommend sizing and positioning your field directly in the Template Builder using drag-and-drop, and then using these 4 properties to fine-tune the size and position if necessary. 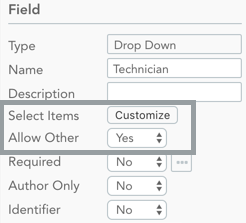 Note that these properties will change as you move/resize your field within the Builder. Look-and-feel properties appear in the Form View only, as with size and position properties. These properties differ somewhat across different field types, but the ones described here appear in all or most fields. Note that the background colors (see Background and Focus Color below) only appear while the form is being filled out — they are no longer visible after the form is completed or when the form PDF is shared or printed. All other look-and-feel properties persist after form completion. Align: The alignment of content within the field. Text can be aligned with the Left or Right side of the field, or Centered within the field. Other items (e.g. Images or Sketches) can be Centered or aligned with the Top Left corner. Font: The font of any text inside the field. Our standard set of web fonts include: Arial, Courier New, Georgia, Helvetica, Times, Trebuchet MS, and Verdana. Size: The font size of any text inside the field. Color: The color of any text or symbols inside the field. Background: The color of the background behind the field while the form is being filled out. When the form is completed, all background colors disappear. Focus Color: The color of the background when the user selects this field. When the field is not selected, the background color is determined by the Background property. This property is available for Text Box, Number, Barcode and Table fields. 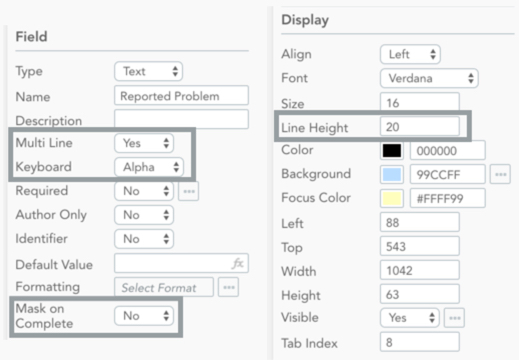 Tab Index: The index of this field when tab-navigating through the form. Tab navigation is done using the Next button on a mobile device, or the [Tab] key on a keyboard. 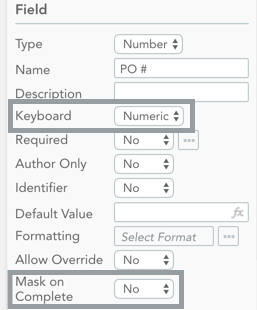 For instance, if your form has 3 fields A, B, and C indexed 4, 2, and 7 respectively -- then the tabbing order will be B, A, C. This is handy for users who want to quickly fill out the form without having to select each field individually. This property is available for Text Box, Number, Barcode, and Table fields. We recommend setting the Focus Color property whenever you set the Tab Index, to make it easier to see which field is currently selected when you are tab-navigating through your form. Visible: This is the only Display Property that appears in the List View. It determines whether this field instance will be visible. Sometimes, you may want to include fields in the form that are not visible to the user but are visible in reporting afterwards, like some calculated fields. Or you may want to make a field visible to some users and not others. You can do so with this field. The Field properties listed here are common to most GoFormz fields. Field Properties determine your field’s behavior and metadata. These properties specify the form’s metadata — i.e. data about the form, rather than anything within the form itself. Type: The type of field this is (e.g. Text, Image, Checkbox, etc.). For most field types, this property is not editable: if you drag a Checkbox into your template, you cannot change it to a different type. However, for Text, Number, and Barcode fields, you can change the type to any of the other three. This is possible because these three field types share so many properties. Name: The name by which the field will be referenced in the Template Editor, within Reports, and elsewhere in the app. The name does not appear in the form itself when it is being filled out. Description: A short text snippet with any explanatory text. The description does not appear when the form is being filled out. It does appear as a tooltip when you hover on the field name in the Reports interface. Identifier: Choose “Yes” if you want this field to serve as a unique identifier for your form. You will generally want to select a field that you expect to be unique across all forms of this type — perhaps something like purchase order number or work order number. The contents of this field will be used in the form name, and as a Shared Field for reporting purposes. Note that you can only have one Identifier per template. When you change a field’s Identifier property to “Yes”, the Identifier properties of all other fields will automatically be set to “No”. These properties control how the field will actually behave — what will appear in the field by default, who will have access to it, etc. Required: Choose “Yes” if you want to make this field required for all users. A user will not be able to mark this form as Complete until this field is filled in. Author Only: Choose “Yes” if you want this field to be editable only by the user who initiated the form. This is useful for enforcing user permissions for particular fields in a workflow. Your form may have to go through several people before it is complete; this lets you specify that certain fields can only be filled out by the person who initiated the form. Default Value: The value that appears in this field by default when the form is first opened. 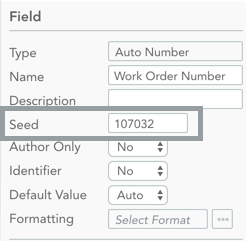 For text-based fields, this value can be a formula that either repeats a value from another form field, gets a value from a database column, or performs a calculation based on one or more other fields. See here for documentation on calculation syntax. For other field types, you may be presented with a dropdown of Default Value choices. Allow Override: This property is useful if a formula (calculation or DataSource reference) is used as the Default Value for this field. Choose “Yes” to allow a user to enter their own value for the field, overriding the formula. Otherwise, the field will always default to the calculated value. The Formatting property determines the format in which the user's input should be displayed. The user isn’t forced to enter text in this format, but it will be converted to this format whenever possible. Click the [...] icon next to the field to bring up the Format Editor dialog. "hh:mm:ss" stands for time in hours, minutes and seconds -- "10:05:32"
"##,###.00" stands for a number with thousands separators and two significant digits after the decimal point -- "1,234,567.89"
See here for more on formatting string syntax. Some GoFormz fields are specific to just one or several types of fields. These are documented below, for each field type. See here for more about the field types themselves. Seed: The number of the first form created from this template. This number will be incremented by 1 for each successive form that is created. Other Properties: See Common Field Properties and Common Display Properties. Keyboard: The keyboard that appears when a user taps this field on a mobile device. Choose "Alpha" for a keyboard with letters, or "Numeric" for a keyboard with numbers. This property has no effect on a desktop device. Mask on Complete: Choose "Yes" to hide the text in this field after the user completes the form — so “123456789” would appear as “*********” when masked. If your barcode numbers are sensitive information and you don’t want them included in any reports, this can be useful. Choose "No" if you want the text to be available after the form is completed. Display: The symbol that is used to fill in the box. Available options are Checkmark, Xmark, Circle, and Oval. A circle or oval may be handy if you want to circle an element on your background form image. Checkbox group properties are a little bit different from most other field types. 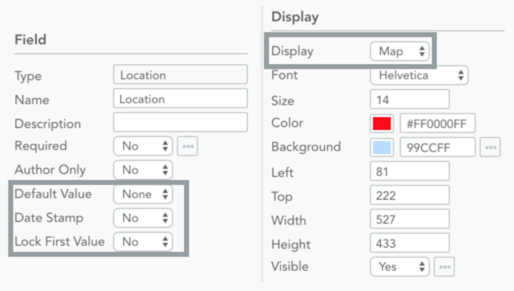 The Field Properties are set for the Checkbox Group as a whole, while the Display Properties are specific to each individual checkbox within the group — so each checkbox can be sized and positioned independently from all the others, and can also have its own individual look-and-feel. You can click a checkbox in the Builder to bring up its Display Properties in the Properties Panel. This property lets you set the names of the checkboxes in this group. Click the Customize button, then use the dialog box that pops up to add/remove and name the checkboxes in your group. 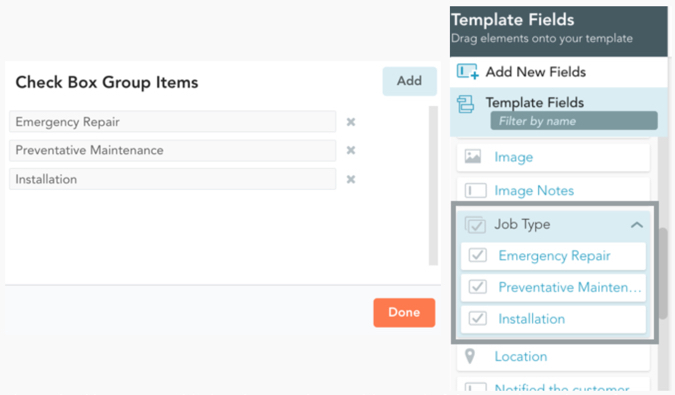 These checkboxes are added to the Template Fields panel of the Template Editor. After creating the checkbox group, you will need to add each individual checkbox from the group into your form by dragging it in from the Template Fields panel. Group Name: See "Name" under Common Field Properties. Group Description: See "Description" under Common Field Properties. Multi Select: Specifies whether or not you are allowed to select multiple checkboxes from the group in the same form. Group Item: This is a read-only field containing the name of this checkbox, as specified in the Group Items property (see above). Display: The symbol that is used to fill in the box. Available options are Checkmark, Xmark, Circle, and Oval. A circle or oval may be handy if you want to circle an element on your form. DataSource: The name of the Goformz DataSource from which you want to source data for this field. Click here for more on Goformz DataSources, including further documentation on how to use the Display Column and Filter properties. 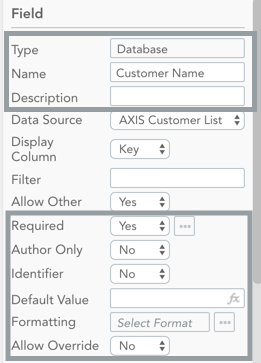 Display Column: The name of the database column that contains the list of options for this field. You can only select columns that have been set as indexes, or keys, in the DataSource. See DataSource documentation for more. Filter: A filter string that determines the subset of Display Column values that should be available as choices. For instance, suppose you have a large customer database, but for this field you only want users to be able to select customers from California. 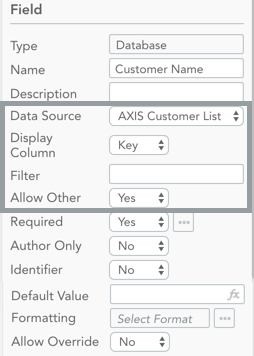 You might set Display Column to "Customer", and Filter to ="State"="CA". See here for a full example of filtering, including filter string syntax. Allow Other: Choose "Yes" to let the user write in an entry. Choose "No" to limit the set of allowed values to just the entries from the Display Column. 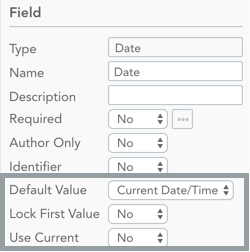 Default Value: Choose "Current Date/Time" to auto-populate the field with the date and/or time when the form is created. Choose "None" if you don't want this field to display anything when the form is created. Lock First Value: Choose “Yes” if you want the first value set in this field to become permanent. When this property is set, the field value becomes uneditable as soon as it has been set once. This is typically used in conjunction with Default Value being set to "Current Date/Time" or Use Current being set to “Yes”. This ensures that the date/time when the form was created is always displayed in this field and cannot be changed. Use Current: Choose "Yes" to auto-populate this field with the date and/or time when it is first clicked/tapped. Note that this is different from Default Value, which auto-populates the field when it is created. This functionality is handy for applications like timesheets, for example: you can have a table with start time and end time columns, and simply click/tap the appropriate field to punch in and punch out. This is often used in conjunction with Lock First Value, so those times cannot be changed later. Note that you will never want to use this property in conjunction with Default Value being set to “Current Date/Time” — that would defeat its purpose since your date would then be filled upon form creation. Display Name: The item name that will appear in the Drop Down list when it is expanded in the form. Value: The value corresponding to this item. This value will appear in reports, and will be passed to any formulas referencing this field. Default: If you want this item to appear by default when the form is created, check this box. 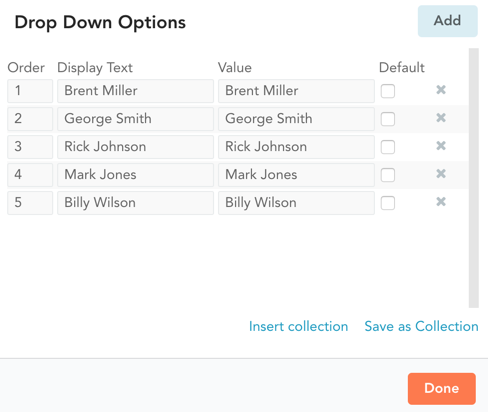 Save as collection: Click this to save your drop down items, allowing them to be reused elsewhere in this form, as well as in other forms that you create. This is handy if you have frequently used drop down lists. Insert collection: Click this to bring up a list of previously saved collections of items. Then select the collection that you wish to use for this Drop Down. Allow Other: Choose "Yes" to let the user write in an entry. Choose "No" to limit the set of allowed values to just the entries from the Select Items list. Image Quality: The quality of the image displayed in this field. There are two options: a) Larger File Size / Higher Quality: This is the default option. It results in a higher resolution image. b) Smaller File Size / Lower Quality: This results in a lower-resolution image. The main reason you might choose this is to make your form load faster — higher quality images will take longer to load, particularly if your form has many images or if you have a slow Internet connection. Attach Original: Choose “Yes” to store the original captured image as an attachment. This gives you the ability to download the image at its original resolution, and with all its metadata (e.g. EXIF or GPS data) intact. You can retrieve this image as you would any other attachment. Date Stamp: Choose “Yes” to add a date stamp of when the image was taken to the lower right corner of the image. This date is obtained from the image’s EXIF metadata. This data will typically exist for digital photos, but may not exist for other image types. If an EXIF creation date does not exist, “No Date” will be displayed. Default Value: Choose “Auto” to show the user’s location in this field by default, whenever it is available. Choose "None" if you don't want this field to display anything by default. Date Stamp: Choose "Yes" to include the current date and time in the upper left corner of the map snapshot. Choose "No" otherwise. Note that this field only applies when the Display property is set to "Map". Lock First Value: Choose “Yes” if you want the first value set in this field to become permanent. When this property is set, the field value becomes uneditable as soon as it has been set once. This is typically used in conjunction with the Default Value being set to "Auto". This ensures that the location where the form was created is always displayed in this field and cannot be changed. Display: Choose "Map" to display the location as a pin on a map. Choose "Text" to display it as latitude and longitude coordinates. Keyboard: The keyboard that appears when a user selects this field on a mobile device. 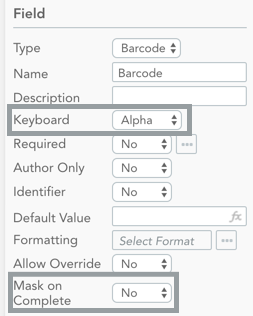 Choose "Alpha" for a keyboard with letters, or "Numeric" for a keyboard with numbers. This property has no effect on a desktop device. Mask on Complete: Choose "Yes" to hide the text in this field after the user completes the form. This can be handy when dealing with sensitive information like Social Security numbers -- "123-45-6789" would appear as "***********" when masked. Choose "No" if you want the text to be available after the form is completed. Image Quality: If you have uploaded an image into your sketch, this controls the quality of that image. 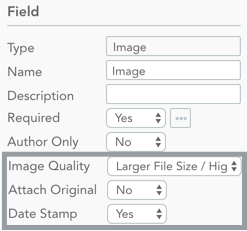 There are two options: a) Larger File Size / Higher Quality: This is the default option. It results in a higher resolution image. b) Smaller File Size / Lower Quality: This results in a lower-resolution image. The main reason you might choose this is to make sure your form loads faster — higher quality images will take longer to load, particularly if your form has many images or if you have a slow Internet connection. 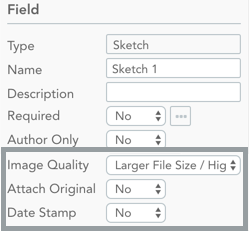 Attach Original: If you have uploaded an image into your sketch, choose “Yes” to store the original captured image as an attachment. This gives you the ability to download the image at its original resolution, and with all its metadata (e.g. EXIF or GPS data) intact. You can retrieve this image as you would any other attachment. Date Stamp: If you have uploaded an image into your sketch, choose “Yes” to add a date stamp of when the image was taken to the lower right corner of the image. This date is obtained from the image’s EXIF metadata. This data will typically exist for digital photos, but may not exist for other image types. If an EXIF creation date does not exist, “No Date” will be displayed. 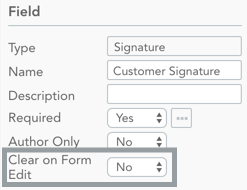 Clear on Form Edit: Choose "Yes" if you want to clear the signature as soon as any other form fields are edited. This is useful for approval workflows — you may not want a supervisor approval signature to persist after the form has been edited. Choose "No" otherwise. Multi Line: Choose "Yes" if you want text to wrap when it reaches the end of a line, creating multiple lines of text. Choose "No" if you don't want text to wrap. Line Height: The amount of vertical space, in pixels, reserved for each line. For multi-line text boxes, the difference between Line Height and Size will give you the amount of space between lines — if line height is 20 and font size is 16, there will be 4 pixels between lines. Tables are structures containing other fields, which makes setting up a table a little bit different from setting up other fields. See here for more on adding a table to your form template. In this section, we go over the properties unique to tables, both at the top level and at the table column level. Rows: The number of rows in this table. Padding: The number of pixels that should be left blank along the left and right edges of each table cell. Including some padding can make a table easier to read, because it makes sure the text inputs in different table cells don't run into each other. You can override this setting on a per-column basis. In addition to the Field and Display properties, the Properties panel for tables has an embedded graphical interface for adding, removing and reordering columns under the Columns heading. See here for more on using this interface to manage your columns. Once a column is added, you must set a Type for the column, along with its other properties. We go over column properties next. A table column consists of a set of fields of the same type. For this reason, the properties of a table column are the same as the properties of the selected field type (i.e. if it’s a Checkbox column, it will have all Checkbox properties). However, there are some properties that do require additional documentation: a few properties are specific to table columns, and a few properties have the same name as they do for other fields but slightly different behavior. We cover these properties here. Type: The type of field in this column. You can select any type here, with the exception of Auto Number, Checkbox Group and Table. 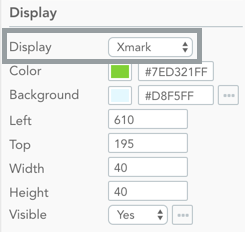 When you select a field type, the properties in the panel will change to that field type’s properties. Name: The name by which this column will be referenced in reports, calculations and elsewhere. The full name of the field in reports will be “/”. Locked: Choose “Yes” to lock this column. A user can view a locked column but cannot edit it. Padding: The number of pixels that should be left blank along the left and right edges of each table cell in this column. This property overrides the Padding property set at the Table level, allowing each column to have different padding. Hidden: Choose “Yes” to hide this column, so that it is not displayed in the table. This is a lot like hiding a column in Excel — the column is hidden, but can still be referenced in a calculation. Transparent: Choose “Yes” to make this column transparent. A transparent column takes up space in the table, but does not display any data, and users cannot input data into it. This can be useful if your table background image has a column with some pre-filled information, for example. As with Hidden columns, a Transparent column’s values can still be referenced in calculations. Table columns also have also some properties that are set separately for each row. We see this above with the Default Value and Filter — there are 4 instances of each of these properties because the table has 4 rows. This is especially useful when you want the value of the property to depend on the values in another column. 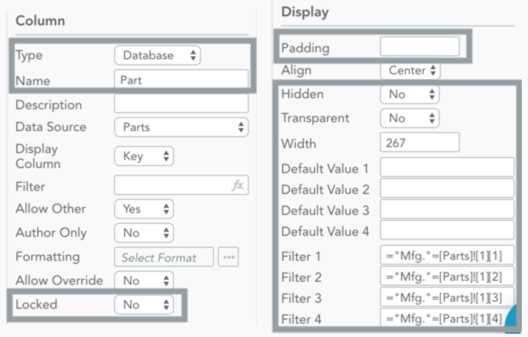 In the example above, we use the manufacturer set in the “Mfg.” column to filter the list of parts displayed in the Database field to just the parts made by that manufacturer. We do this by referencing the appropriate table column and row — e.g. [Parts]! references column 2 row 4. Likewise, you can imagine the Default Value field using the value in another column to auto-fill the field. See here for more.